It is back. It's the haze. Whether it is originated locally or otherwise, this phenomena is not something that we look forward to. The haze is bad for our health. It is interesting that our neighbor recognizes that the present haze originated from their side and I hope they will do something about it. 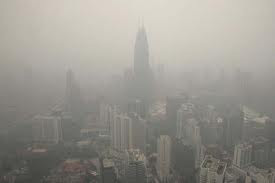 While the weather has its influence on the occurrence of haze, human remains the major contributor. It their quest for economic development, they will do anything to get things their way including clearing the forrest using the slash and burn technique. 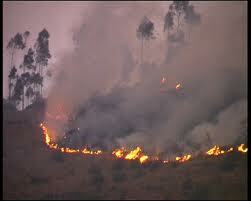 While burning down the forrest is cheap, it also releases smoke and huge amount of carbon dioxide into the atmosphere. Haze is not something new and unexpected similar to human greed. It becomes unexpected as we could predict greedy people, whether they are the owners of the land or the contractors who are tasked to clear the land, to create this mess annually is pursuing wealth and money. In certain circumstances, those with authority are also the culprit because of their failure to act decisively before the haze problem become serious, maybe also due to the greed factor as well. What do we do as ordinary citizens? I believe we should not just accept this as a recurring event without doing anything. We should indicate our unhappiness to companies which are using this the slash and burn technique, irrespective of where these companies originated from. This includes Malaysian companies operating in foreign countries where the haze comes from. If they have products sold in our supermarkets, just boycott them to show our displeasure of their irresponsible behavior. We should also urge the authorities to be more pre-emptive in dealing with issue. As haze is a cross border issue, it should not be a problem of a single country. Unless, we the citizens, do our bit and make this an issue one which will determine how we vote, it may not be high on the agenda of politicians. We should make it known that haze or combating haze matters to us as citizens and this will influence our support when it matters. Please contact your friends in other countries around this region and get them to do the same. Hope this will trigger a regional effort to reduce the incidence of haze in the future. Meanwhile, please take care of your health.